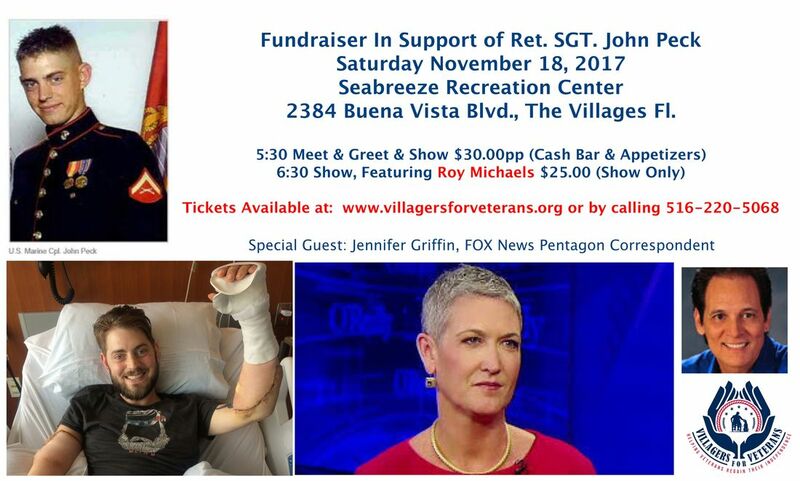 With its goal of $10,000, a Villagers For Veterans fundraiser, Saturday evening, will help a military hero continue his incredible battle to return to a life of self-independence. John Peck, then a 24-year-old Marine, had lost both arms and legs stemming from an improvised explosive device (IED) in Afghanistan, May 24, 2010. He then spent two years in Walter Reed National Military Medical Center undergoing 27 surgeries, months of daily medical procedures, and endured countless hours of intensive rehabilitation. Marie Bogdonoff and John Peck, center, Saturday night at SeaBreeze Recreation Center. Also with them, from left, are Joe Bogdonoff, John Woodall, president of Camp4Heroes, Jennifer Peck and Shanda Taylor Boyce with Timber.Peck became the third quadruple amputee of the Afghan and Iraq wars, and the first Marine to receive a double-arm transplant. He also has the distinction of being only one of two people to ever survive blood contamination by the flesh-eating fungus, Aspergillosis. Some 250 Villagers gathered at the SeaBreeze Recreation Center to honor his wartime service and financially support Peck’s on-going recuperation. The evening was spearheaded by Marie Bogdonoff, Villages for Veterans founder and president. Peck’s medical ordeals had begun in 2007 in Iraq’s Al Anbar province when his vehicle detonated an IED. He suffered a traumatic brain injury as well as severe vision, balance, hearing and memory difficulties. His injuries earned him the first of his two Purple Hearts. Once Peck’s health improved, he requested to return to his comrades then in Helmand province, Afghanistan. Four months into his tour, he stepped on an IED. The resulting blast amputated his legs, parts of his right arm, damaged his left arm and caused third-degree burns on his stomach. Complications from one surgery required the amputation of part of his left arm, making him the third quadruple amputee of the Afghan and Iraq wars. During another surgery, Peck “flat-lined” three times and once was pronounced dead. Saturday’s gathering was the non-profit organization’s second fund raiser for Peck. Members of Tri-County Women Veterans as well as Villagers for Veterans Betsy Nolan, Mariane Estes and Sue Roper.Since its formation in 2014, Villagers for Veterans has raised more than $500,000. The organization has presented 19 all-terrain wheelchairs to paraplegic and quadriplegic veterans who had served in Afghanistan and Iraq. Besides the many fund raising activities, it sponsors educational initiatives such as PTSD seminars and provides respite services for care-giving families. Now, Peck and his wife Jessica are planning on building a new home, near Walter Reed, in Silver Springs, Maryland. Marie Bogdonoff and John Peck, center, Saturday night at SeaBreeze Recreation Center. Also with them, from left, are Joe Bogdonoff, John Woodall, president of Camp4Heroes, Jennifer Peck and Shanda Taylor Boyce with Timber. Members of Tri-County Women Veterans as well as Villagers for Veterans Betsy Nolan, Mariane Estes and Sue Roper.